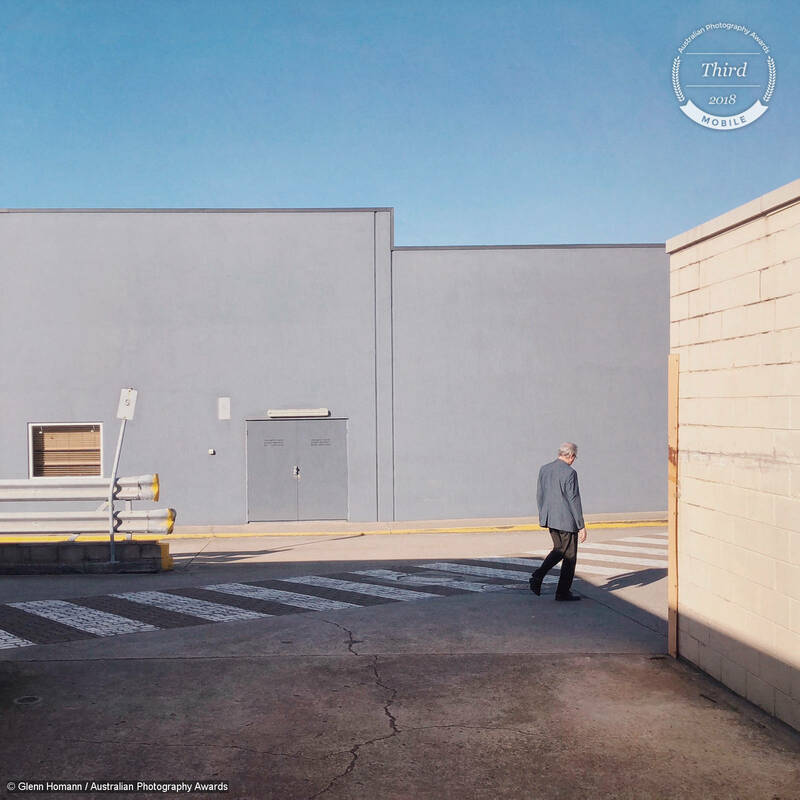 Thanks for joining me, APA competition judge Matt Palmer, as I look at the winning Australian Photography Awards Mobile photograph of 2018 as well as looking at what made the rest of the top ten so successful. The mobile category in 2018 was full of amazing and ingenious photography, even without consideration of the use of mobile devices! The top 10 show just what the medium is capable of and holds a few surprises, so let’s get started! Even during the preliminary judging round, Zoe’s Emu Tree was a bold standout. Zoe cleverly uses the mobile device to get lower to the ground, creating a perspective where the emu’s head and neck disappear behind its body. This allows Zoe to explore an extremely deliberate observation of emu replicating the form of a tree. A tree is composed in frame for the purpose of guiding the viewer to the same observation. The detail in Emu Tree is incredible, with texture in the legs, feet and feathers that you can almost feel. The detail captured shows that even mobiles a few years old are capable of amazing image making. Emu Tree is strong and monolithic, clever and calculated, with more than a healthy dose of ‘why didn’t I think of that!’. Perhaps the risk of pecking and kicking is best braved by experts like Zoe than myself! 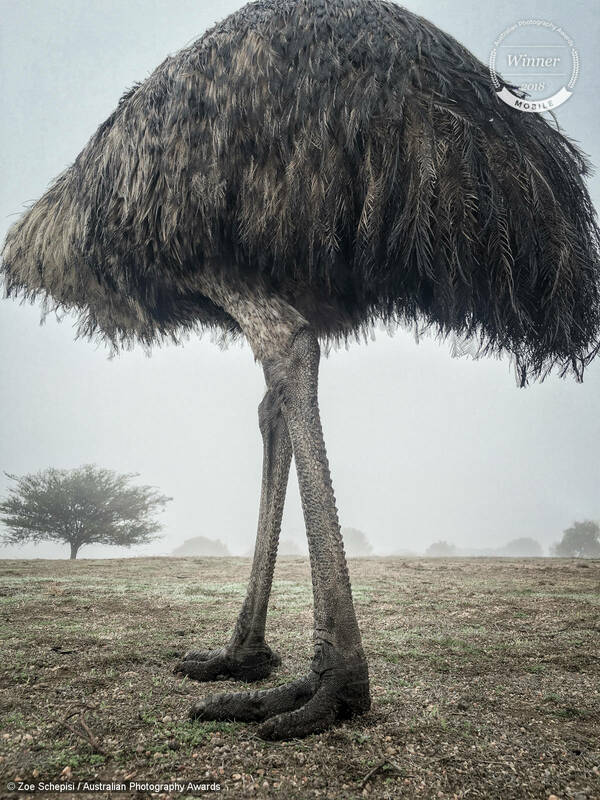 Everyone involved in the Australian Photography Awards is thrilled to have Zoe Schepisi’s ‘Emu Tree’ represent the mobile category as its winner in 2018. Sometimes a mobile phone can get you an observational portrait when a larger camera might spoil the moment. 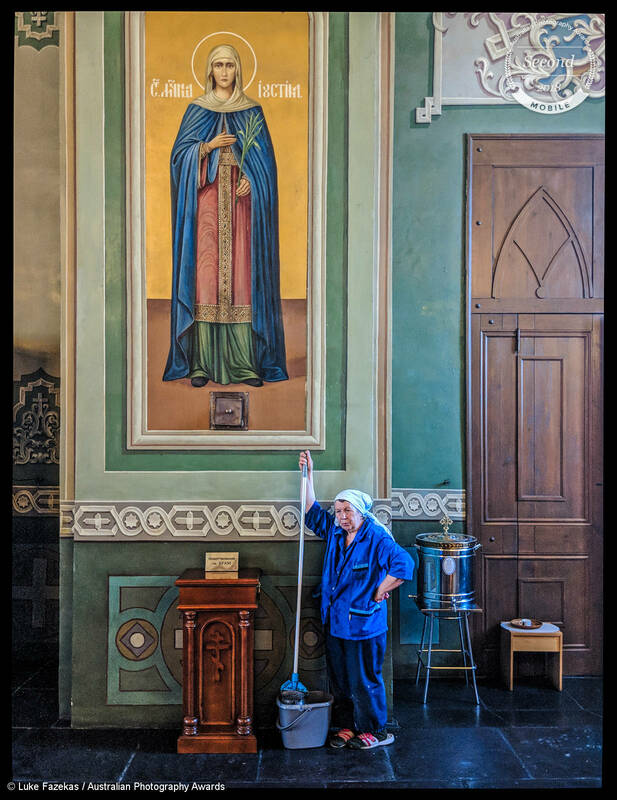 Luke uses the mobile medium cleverly in this shot taken in Kazan Cathedral, Russia. The Mother Mary soars above in a huge painting, reverent and respected. The hard-working cleaner wearing a garb of comparable colour and with head covering takes a break below, quite possibly oblivious to the opportunity she is presenting as a subject. Her sandals and socks combination speaks to a slightly less revered position within the church! There is some fantastic detail in this capture and the framing is perfect, allowing the observation to sit in the scene with space to breath. Glenn brings us the kind of photograph we imagine when we think of great mobile-based street photography. Compositionally the photograph is excellent, offering an asymmetrical balance and leading you to the key subject using the pedestrian crossing. The man about to exit frame is positioned in a way that allows for the light, creates a strong shadow, and creates a dynamic where he is leaving the frame. The warehouse door helps balance the jacket, the window shutters on the left balance with the warmth of the building wall on the right, and the yellow paint on barriers on the left balance the yellow painted steel on corner of the building on the right. Everything in this photograph is so cleverly balanced and considered. I have a feeling we will be seeing more of Glenn Homann soon. Very soon actually. Glen shows here that he’s equally comfortable in natural environments as urban ones. This simple landscape is so beautifully composed and handled. 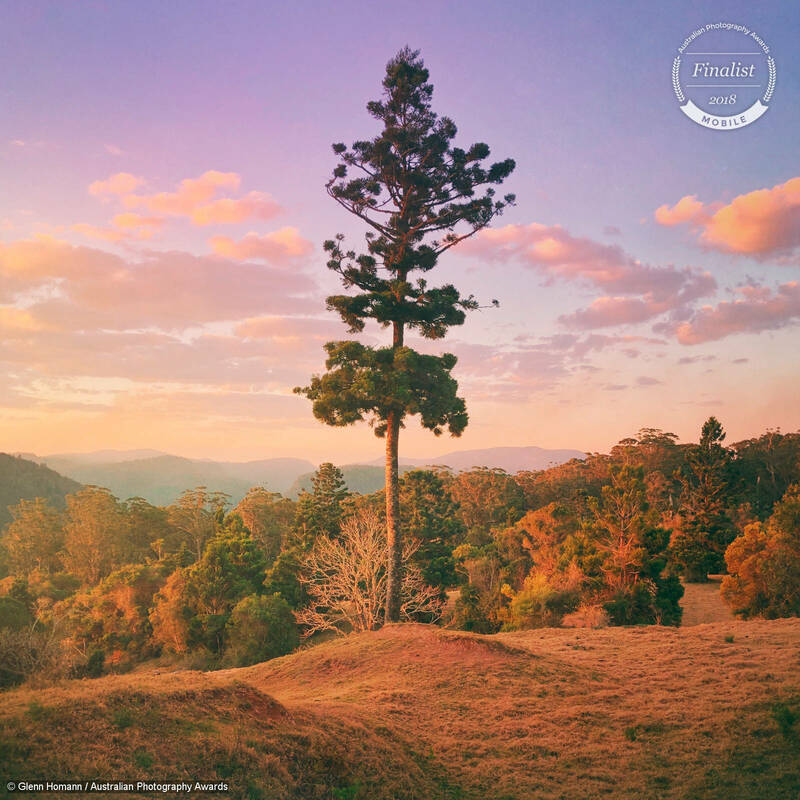 The tree is perfectly placed so that the foliage sits above the mountains on the horizon, creating a very clean shape that is necessary for the tree to shine. The dynamic range and tonality of this photo is incredible for a mobile device and shows both Glenn’s careful handling of the file and the advances made in mobile camera technology. The sunset’s pink and purple hues are rendered perfectly here with no loss of highlight details. This landscape is so inviting, who wouldn’t want to be bathing in the warm orange light of the sun taking in this scene? 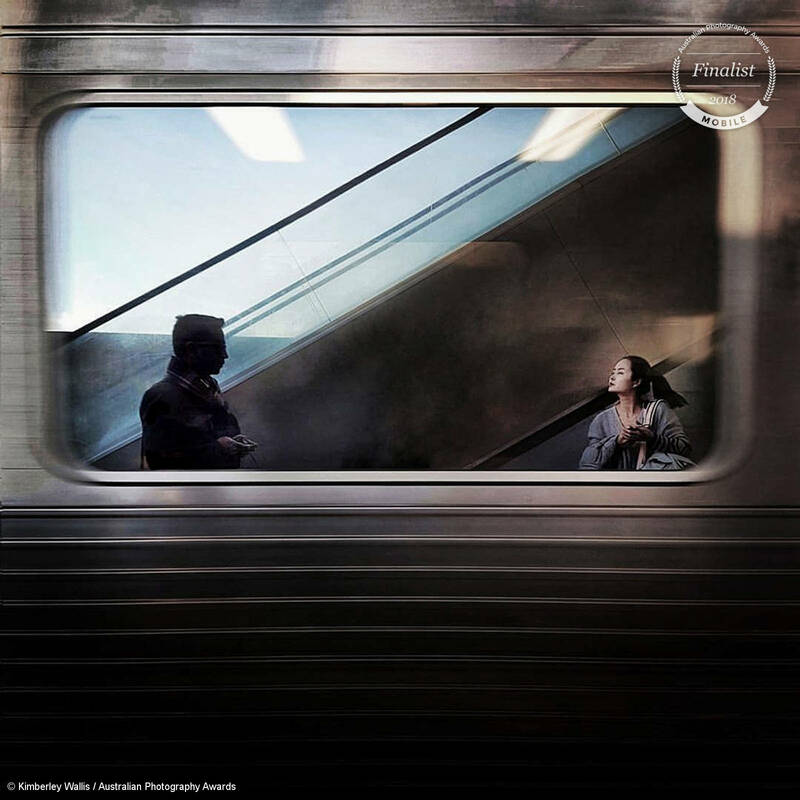 The moving window frame of a train is cleverly used to frame street-style scenes by Kimberley that push mobile phone technology. This photograph leaves me with questions, both in terms of narrative and technique. The lady on the right is beautifully rendered in light, looking intently into the distance awaiting someone, something, or perhaps just the next train. Both of the figures are intentionally placed within the diagonal lines, leading you to each of the subjects contained within the window. Technically I question where the photographer is positioned. Unless it’s multiple frames merged, they aren’t inside the train. Which leaves me to wonder how the photographer has disguised themselves from the capture or removed themselves, and how the various reflections are interplaying in the way that they do. Perhaps the title is the hint? One thing I do know – I love the result! 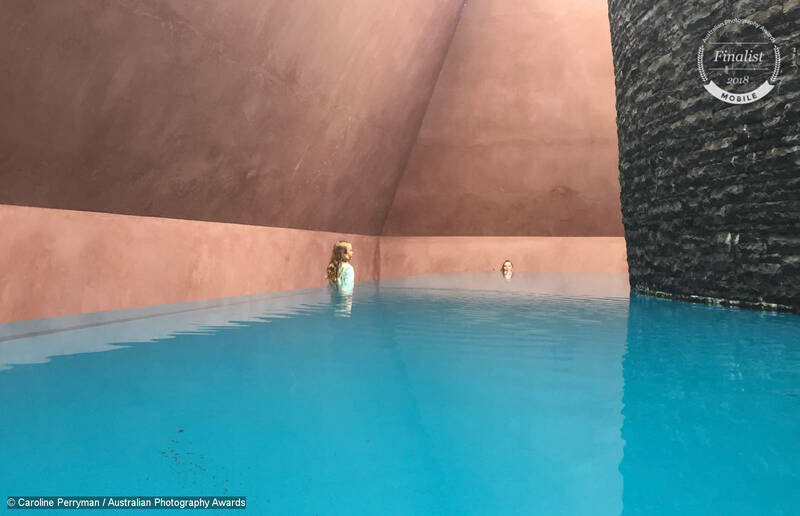 Caroline cleverly reinterpreted artwork and architecture at the National Gallery of Australia to create this photograph of her daughters. The water floats the visual of the figures around it, and there is a nice juxtaposition between the expressions and positioning of the two girls. One is rather considered in her approach to the artwork, while the other appears more playful at the water’s edge. Caroline has also made the choice to leave some leaf litter or debris in the bottom left of the pool. This could have easily been removed but its presence helps reveal the context of the environment and water as well as playing off the heavy stone on the right. Death is rarely handled with this level of poise and delicateness, and to do so with a mobile device is extraordinary. 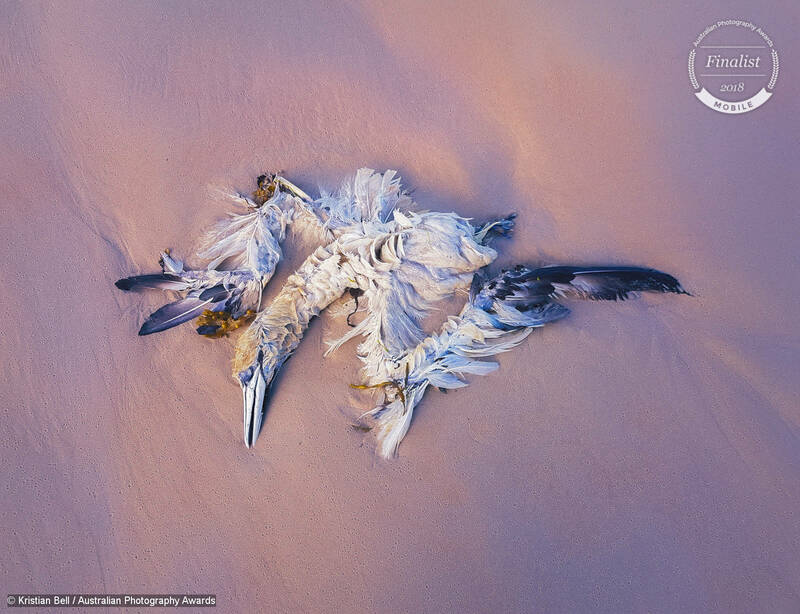 Although it may be confronting, there is an odd beauty about this gannet as it decomposes in the sand. The way its head rests, curved on the sand, is quite elegant. The creamy pink and purple light is also divine and the angled sunrise or sunset light illuminates the tiny air bubbles that have formed holes across the sand. It creates an amazing textural element. This is a very simple photograph and observation captured extremely well and at the very best time of day. Kay’s mobile self-portrait pushes the boundaries of the selfie artistically and technically. The hands are positioned evocatively and clouds have been tinted with fiery colours to evoke a feeling of flame coming from herself. Perhaps speaking to how she identifies herself, her way of relating to other people, or her temperament. 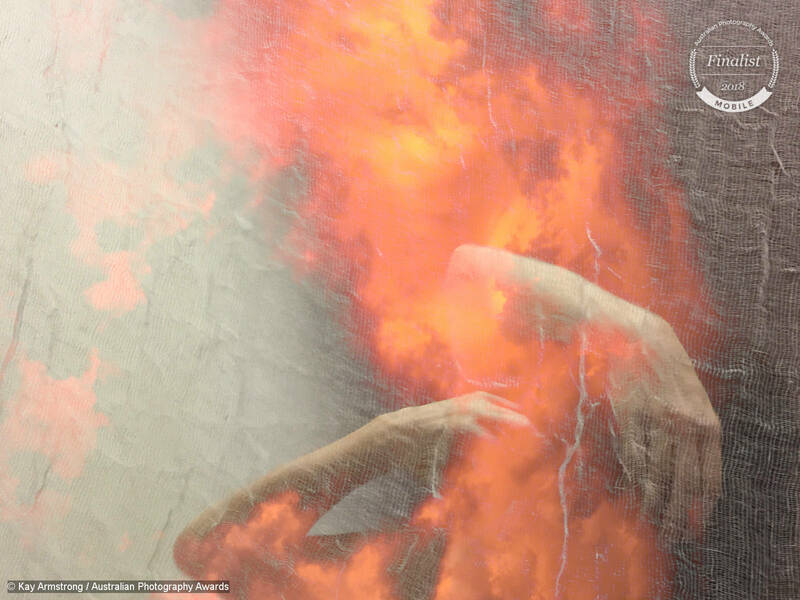 A fabric such as hessian has been overlaid to create a strong textural element across the frame, and the transition from dark to light is well placed at the flames. Perhaps the hessian indicates a feeling of entrapment? We look forward to seeing what is done with mobile photography in the coming years as photographers like Kay experiment to create new narratives. Glenn Homann’s capture of the streets of Sydney may not be immediately identifiable at first, it pulls us emotionally to somewhere more foreign and romantic like Paris or other European destinations. The composition here is absolutely spot on. The foreground trees have been used excellently to frame the image as well as cover up some of the vehicles on the street. The branches form a perfect frame for the couple deliberately captured in a path of light in the bottom left. The reflection also indicates recent rain that adds to the atmosphere as well as providing that reflective surface. The street and branches then guide us to the Sydney Harbour Bridge, the only solid hint at where the viewer is located. 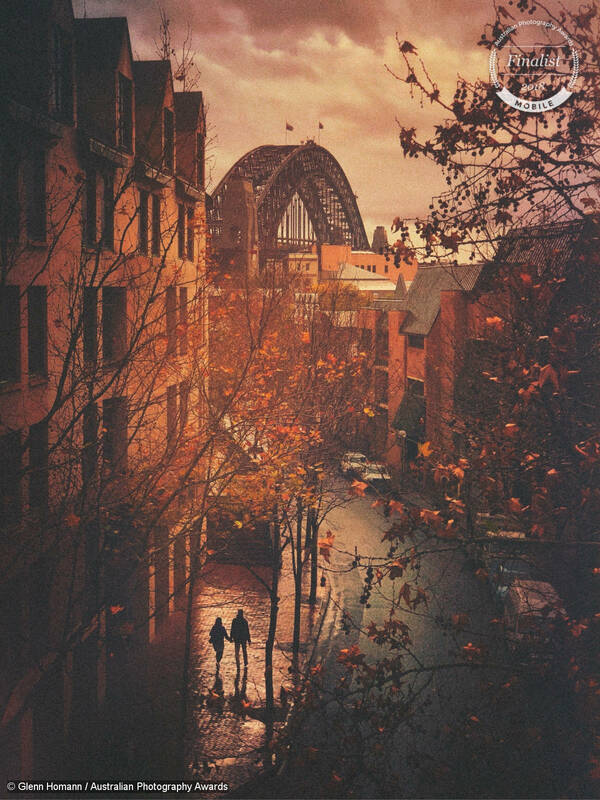 This is a beautiful, romantic and evocative capture of Sydney that stands as a fantastic shot irrespective of the medium it is captured on. And shot under the restrictions of a mobile? Amazing. This capture of a bowling alley scene demanded the judges attention with its interesting mobile emulation of the slit-scan technique from film. The technique was used in the film days to create various distortions, and because it required a lot of frames, was an expensive process to undertake. In this photograph, Steven used 1268 continuous separate frames to create this unusual distorted scene. It’s easy to get caught up in technique and lose sight of the result. The result is interesting, innovative, and the foreground figures take on a sculptural feel, juxtaposed with unusual morphed shapes and a few more visually legible bowlers in the background to provide context. It’s a cavalcade of the bizarre and we can’t wait to see what Steven does next. Thank you for joining me as I discuss our Australian Photography Awards Portrait Top 10. With over 1.3 trillion photos taken last year, and many of those taken with mobile devices, the mobile platform continues to innovate, and the photographers entering our mobile category are pushing the mobile platform to its limits. Thank you for your entries and support this year, it’s been an exciting category to judge!